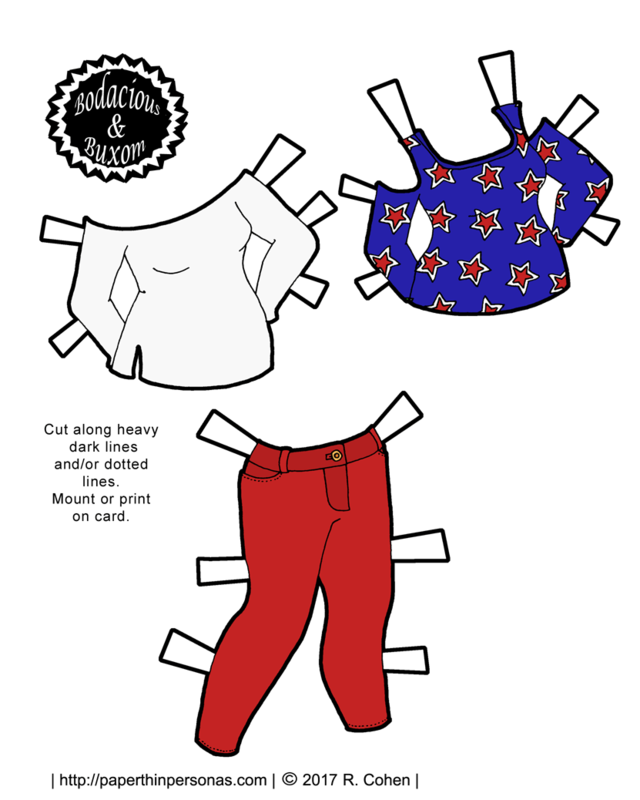 I didn’t really design this paper doll clothing set to be 4th of July themed. I just wanted to do red jeans and a shirt with stars on it. Somehow once I was coloring the set, the patriotic theme seemed inevitable. The truth is that I tend to forget most holidays. I think I have all the time in the world and then suddenly they are upon me and I panic. The entire Mini-Maiden series owns its existence to my holiday panic. Despite that I want to do holiday themed sets. I just seem to forget a lot. Maybe the thing to do is start planning for Halloween today and then I might not end up scrambling. I’ve always admired Liana’s October themed months. I need to some up with an idea for the month or maybe just something for the 31st. I hope everyone in the United States has a great 4th of July. I plan to spend mine playing board games, eating barbecued chicken and peach pie.